I meant to send this out earlier in the week, but I’m just getting to it now. Great stuff from StatsByLopez. Make sure to check out the FanGraphs graph of the 2004 ALCS series. Really neat display of that data. The greatest comebacks in post-2000 Boston sports history, ranked by a combination of estimated statistical improbability & game importance (postseason only). 1. 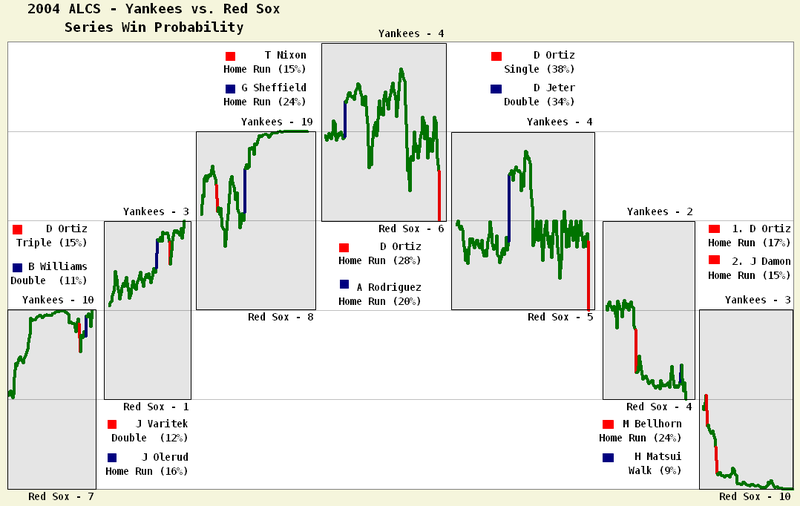 Red Sox 2004 Series vs. NY Yankees: Win Probability, 0.0175 (1 in 60). This win probabilities accounts for Mariano Rivera as the Yankees closer (0.14 chance of the Sox winning Game 4), and uses an equal chance of each team winning the final 3 games (1 in 8 for the Sox winning all 3). I thought this graph was pretty unique, as it looks at the series probabilities across all seven games. The opponent and situation (ALCS) increase the importance of this comeback, helping to make it the greatest in recent Boston sports history. 2. Bruins 2013 Rd 1 Game 7 vs. Toronto: Win Probability: 0.02 (down by 3, 10 minutes left) and 0.007 (down by 2, 1.4 minute left).